Premium Sliding Doors Pty Ltd > Blog > Cavity sliding doors, benefits . 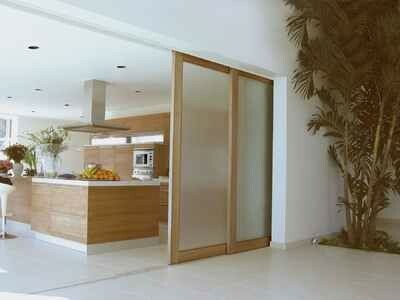 Premium Sliding Doors offer many benefits for you house environments. In addition to function, our sliding doors contribute to the aesthetics of the environment. When designing office spaces, here are a few benefits of using our sliding doors. Security is an important consideration, especially in business or house environments. Sliding doors should have extra stability, with incorporated gaskets and seals. A locking mechanism will prevent the door from being removed from its cavity unit frame. A sliding door can increase the functionality of the space. A hinged door requires many more square feet of space than our sliding door. There is nothing impeding the door, since the sliding door operates on a track. This is great for small office spaces or environments that house a lot of equipment, materials, or furniture. A sliding door incorporate in cavity sliding unit in a large space can provide a more open floor plan with an inconspicuous area for private meetings. Our sliding doors can be efficient insulators or allow ventilation, both of which reduce the energy needed for heating or cooling the space. The amount of light also can adjust based on the door material. A sliding door that maximizes the indoor lighting or utilizes natural light lowers electricity costs. The use of a glass sliding door that allows in natural light, reduces the need for artificial light sources. Sunlight can also provide additional heat in the winter that can reduce heating costs. In the summer, integrated blinds between layers of glass in the door can block sunlight to lower air conditioning costs. We offers many options to tailor a sliding office door to the requirements of a particular space. Different materials are utilize to allow for openness or privacy. Such as glass, wood, or aluminium (any colour). The simple look of a cavity sliding door can be paired with many architectural styles and still integrate with the environment. While all doors serve a similar function, the style, and how a door functions. Premium Sliding Doors add style to a professional environment. They can iterate the brand of a company or provide an inviting. Aesthetic look and feel to the office environment. Sliding doors integrate with a variety of architectural styles creating a sleek look. Premium Sliding Doors offer many benefits for house office or any other professional environment. They can easily be incorporated into a variety of spaces while retaining integrity of the design. Premium Sliding Doors Systems offers quality. High performance good costumers services. And best prices on Australian market for sliding doors (wood, glass and aluminium) and cavity sliding frame . We also provide doors for your various architectural applications.